There was a farmer who grew watermelons. He was doing pretty well, but he was disturbed by some local kids who would sneak into his watermelon patch at night and eat his watermelons. He made up a sign and posted it in the field. The next night, the kids showed up and they saw the sign which read, "Warning! One of the watermelons in this field has been injected with cyanide." The kids ran off, made up their own sign and posted it next to the farmer's sign. When the farmer returned, he surveyed the field. 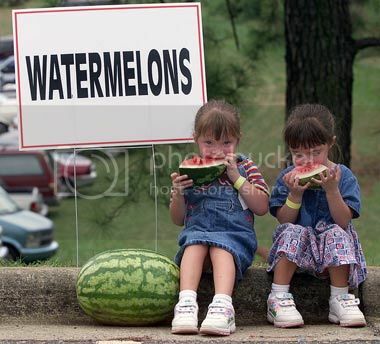 He noticed that no watermelons were missing, but the sign next to his read, "Now there are two!"